As I described in the my earlier blog post, we made it to the start line of the Rock/Creek River Gorge Trail Race with only minutes to spare. My “warm-up” was the mad dash from the car to the start line as I put on my Nashville Running Company shirt. I quickly filled up my handheld, said hello to some of the awesome Chatty folks — Chris, Nathan H., and the RD, Brian — and then toed the line. I knew that I wanted to be pretty close to the front of the starting line, but getting too far in front still makes me uncomfortable. I found a spot that I liked just as we took off. From the outset, we were headed up a hill. People were already starting to jockey for good positions as we went up the hill and started down a graveled jeep road. I settled in behind Nathan G from RunWILD just as we went down the steep stone stairs and onto single track. We were in a pretty sizeable train of runners which was nice at the start. It forced me to go a little more conservatively than I would’ve had I been out on my own. As we wound around a switchback and up some rocks, I saw Phil . . . and the second place female or “White Shirt”. As I typically do before a race, I ultrasignup stalked the competition. There was a chick on the entrants list whose name I recognized. Super strong, super experienced, super fast. I thought White Shirt was her coming up hot behind me. We were still in a pretty big train though so I wasn’t too worried. However, the slowness of the train was starting to get to me. While I was glad it forced me to conserve, the “easy” pace soon became too slow. People had definitely gone out way too fast and were already donezo. We were getting close to the first aid station. I could tell White Shirt was going to try and make her move on me. I kept telling myself to “run your race” and “don’t worry about White Shirt.” Luckily, there was no spot for her to pass as we were still on single track and in the slow train. As we came through the first aid station around mile 3.5, I was still behind Nathan G, and he smartly passed the slower leaders of the train. I followed suit. White Shirt was right behind me. The voice in my head shifted from “run your own race and don’t worry about White Shirt” to “if you’re going to get beaten, have the guts to get beaten at the end, putting it all on the line, making everyone else work their hardest to beat you.” Just as I thought this, White Shirt tried to step off the trail and around me. Not here, not like this, White Shirt. So I picked up the pace until I settled in behind Ken, and White Shirt was a few guys behind me. I knew this section could make or break the race. It’s completely runnable, but I also knew what lay ahead. For the next 3 miles or so, we ran on beautiful single track with some rollers and awesome creek crossings. At some point, I quickly glanced behind me to see who was back there. White Shirt had now been passed by another girl — Blue Shirt — who was running great. She looked strong and comfortable. I knew we were getting close to where the race actually started — mile 7 aid station. My goal was to hold her off until then. Pretty soon, we popped out onto the jeep road/climb up to the aid station. This is a pretty big climb that leads into a pretty big climb. I was ready to suffer and to put this race to bed. I ran up the hill and through the aid station. As soon as you get back on the trail, you’re met with some pretty gnarly switchbacks. I knew these wouldn’t last long, but they are tough. I glanced back once more and saw Blue Shirt about 15 yards behind me. I decided to run the switchbacks at a pretty good pace instead of hiking them. As I made my way up, I looked behind me for the “last time”. Blue Shirt was still hiking up. This was where I wanted to make my real move — I wanted to get out of her line of vision and crush any hope she had. 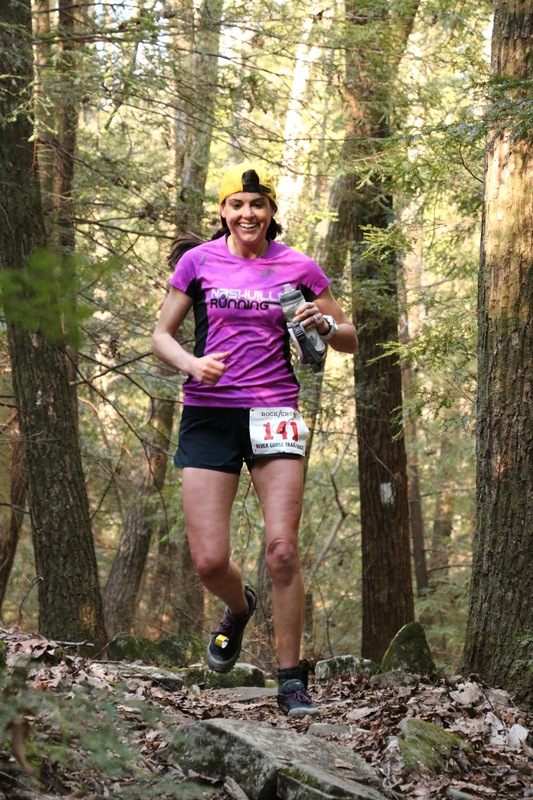 * I was at a completely runnable section, I was still feeling great, and I knew the rock garden was coming up — so I ran like hell. I passed one guy, but other than that, I was on my own the rest of the race. I kept up a pace that I was really pleased with, just trying to put as much distance between myself and Blue Shirt. Soon, the terrain became rockier, and it became darker. The rocks became bigger and more frequent. I finally made it to the rock garden. I “ran” as much as I could through this section, but I struggled through here more than I had in the past. The rock garden also lasted longer than I had remembered. Finally, I reached the climb out and looked behind (I had told myself not to look to see if anyone was behind me after I left the switchback, but I couldn’t help myself). There was one guy but no females. I knew the section between the rock garden and the finish was pretty short so as I was climbing out I kept saying “hammer it home, finish in a way Phil would be proud of.” I glanced at my watch — I thought I was way off pace to break 1:30, but it said 1:24. I turned my legs on as much as they would go and made my way down and then up a half mile or so. I could see the tents at the finish and tried to pick it up even more. 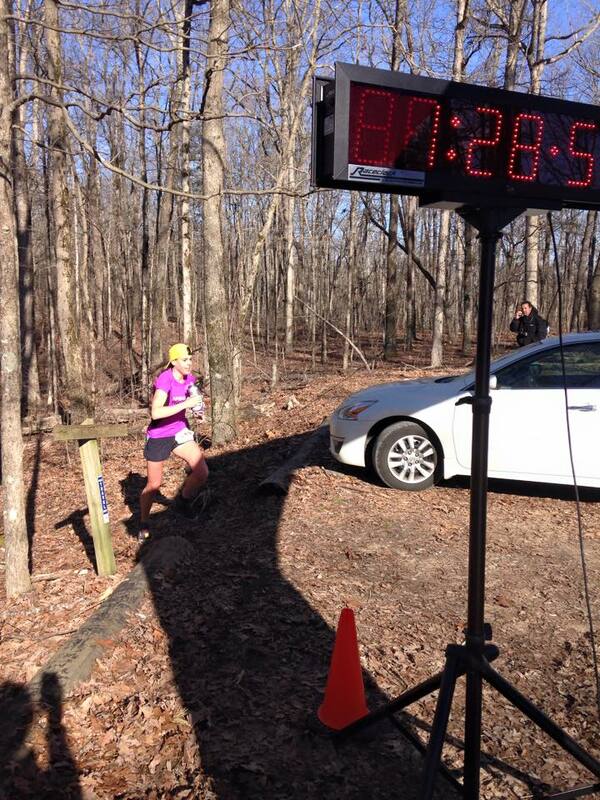 I crossed the finish line right under 1:29 at 1:28:54 and first female. I didn’t break last year’s time which was totally fine. I didn’t go into the race with any time goals or expectations. I do think, because I felt way too good in the final 3 miles, that I went out too conservatively. I did, however, enjoy the first 7 miles much more than last year. I also think what helped me the most was looking forward to the pain and suffering of the final 3 miles. During those first 7 miles, all I wanted to do was get to the climb up to the aid station and start hurting. Anyway, it was a great day, I learned a lot about myself at this race, and I’m ready for more. *Blue Shirt and White Shirt (Molly and Heather respectively) were both incredibly nice and incredibly great racers.